“You went to a prison while on holiday?” the expression is one of disbelief tinged with curiosity. Here’s where I chance on the opportunity to tell the story of my visit to the Iwahig Prison & Penal Farm in Puerto Princesa (PP). Evidently prison visits are not top of the list attractions for most destinations, but in PP there is enough reason to visit when I learned that this was a “free” prison. Passing through lush olive paddy fields dense villages while trying not to inhale dust kicked up from the dirt covered road, I sat in my tricycle wondering how I should greet the prisoners. Would I dare look them in the eye? Surveying my outfit for the day I couldn’t help but wonder if my shorts, buttoned shirt and flip flops was an appropriate choice. Anyway, it was too late to turn back, if the guards stopped me at the gate, I would just have to use my shawl and wrapped around as a sarong. 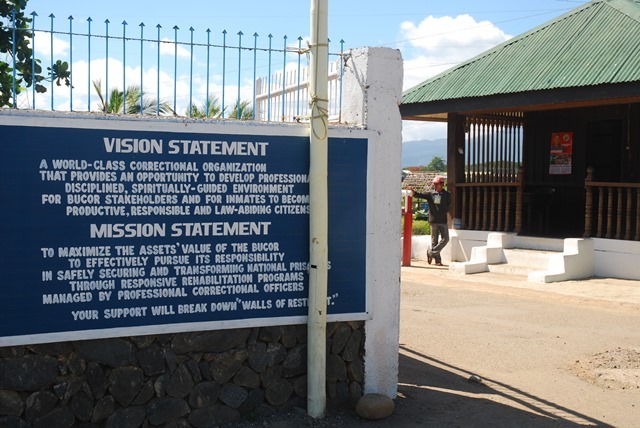 The huge sign with the words ‘Iwahig Prison & Penal Farm’ beckoned us as we approached the compound. A guard armed with a long rifle motioned us to him and made a quick check before waving us in. It was another five kilometers to the prison hub where the prisoners live. The weather was perfect for a field day with clear skies dotted with cotton clouds and monstrous hills as the backdrop. 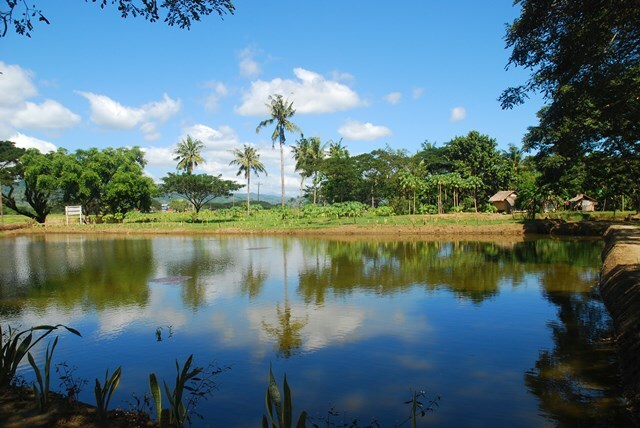 The view was as far as the eye can see; paddy fields, fish farms, veggie plots and organic gardens. We arrived at the souvenir shop, an elevated big wooden building with two large stairways leading up to it. 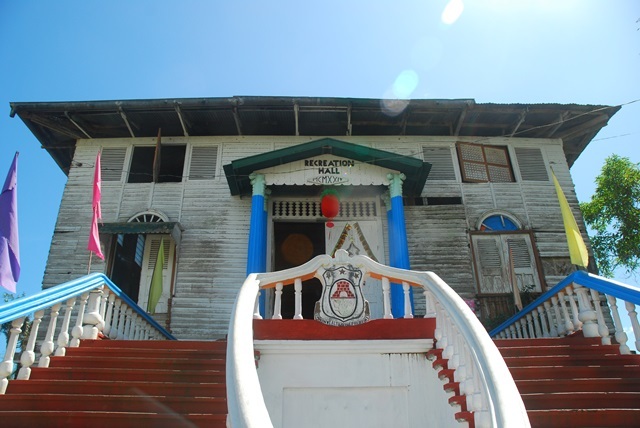 Upon entering the building, a man dressed in regular clothes enthusiastically ushered me in and immediately went into ‘selling mode’ showing me wood carvings, key chains, baskets, t-shirts and pearl earrings. It felt a lot like walking into a market with constant harassing from hagglers, but after firmly declining with a, “No thank you, I will just have a look”, they eased off. I was eager to learn who the prisoners were when suddenly without warning, music started to play. 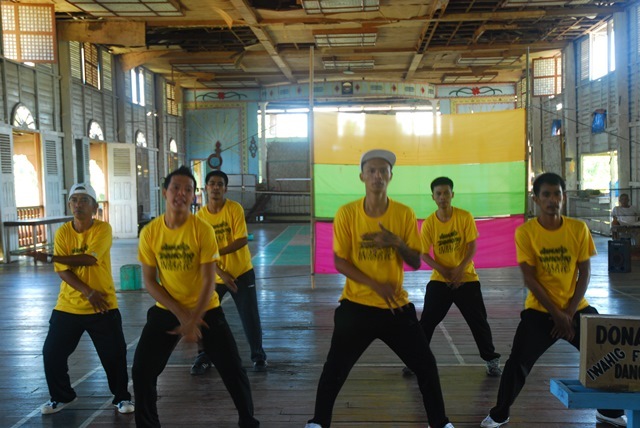 A group of men in yellow shirts leaped into position showing off a fairly impressive dance routine laced with quirky self-induced moves. I noticed all their t-shirts had the letter “P” print at back; I turned around and asked the same guy who tried to sell me stuff if they were prisoners. He said, “Yes ma’am, they are prisoners. And so am I”. At this point I was in quiet disbelief while watching the dance. I had just spoken to a prisoner thinking he was a guard! He introduced himself as Oliver and showed me his tag and proudly explained that he is ranked a corporal – by prison standards that mean he gets to oversee other inmates. Oliver has a kind looking expression plastered on his face and his tan face had many deep wrinkles inscribed on it, perhaps from the many untold stories of living in prison. I went on an interview spree with Oliver asking him about life in Iwahig. From where we were standing, he pointed to the high security building where prisoner are kept in a lock up 24/7. “What about the ‘free’ prisoners?” I asked. To that he said, “85% of prisoners here are free. 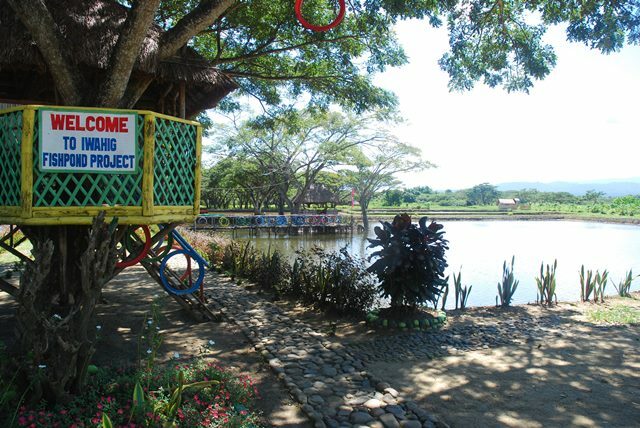 They work in farms, grow vegetables, feed fish and make souvenirs. They come back in the evening to sleep in the quarters”. Prisoners are not handcuffed or chained; they walk freely sharing the 200 acre compound with 3000 inmates. Quite a blissful life, one might think, but when I asked Oliver if he was happy in Iwahig, he stared deeply into my eyes and with such sadness in his voice he said, “Ma’am, no one is ever happy in prison”. 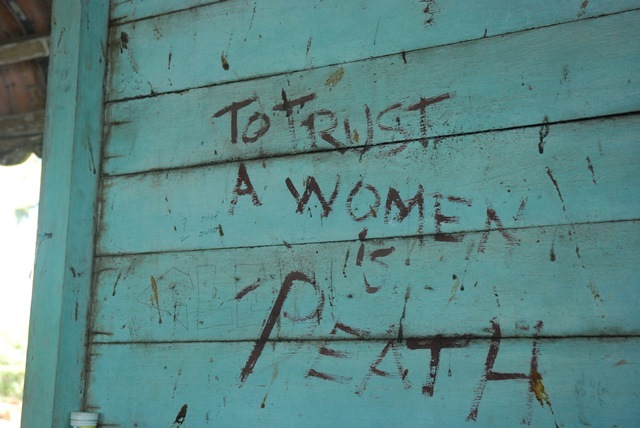 Oliver committed a dreadful murder at 22 years old and was sentenced to life imprisonment. Now at 45 years old he shared with me his longing to see his family. At 22, he left his wife and daughters (ages 2 and 4) in Baguio to live behind bars in Bilibid prison in Manila. At that time, he brought with him photos of his family as memorabilia knowing that it would be impossible for them to visit him as it would cost too much. When Oliver was later transferred to Iwahig Prison, the photos were confiscated from him and to date; he has no tangible proof of his family except for what is etched in his memory and the deep lines on his pleasant face. With a smile stretched across his face, he day-dreamingly said, “Now my daughters are adults”, I couldn’t help but question, would his daughters even know their father is here? Oliver has never written a letter or communicated to anyone since his imprisonment. Each letter requires six stamps costing about 120pesos (MYR 9) and the fact is, although it is a free prison, there is no way of earning any money here. Slightly more well off inmates who have some financial support from their family would bribe the prison guards for the use of their cellphones. Others those who can’t bear isolation from the outside world would eventually try to escape hiding in hillsides and paddy fields for days and weeks. Oliver tells me tales of prison escapes but he said, “Not many are successful, but a few have escaped”. We walked around the building and stopped at a large window overlooking the prison canteen. Clearly there weren’t any scrawny looking prisoners in sight and that is because food rationing at Iwahig is pretty decent. Each person is given a week’s supply of 4.5kg of rice, 2 packs of rice noodles, 7 tins of sardines, 2 eggs, 6 pieces of dried fish and 4 pieces of fresh water fish. Veggies are given only if there is a harvest from the garden. To that, Oliver has little to complain about. 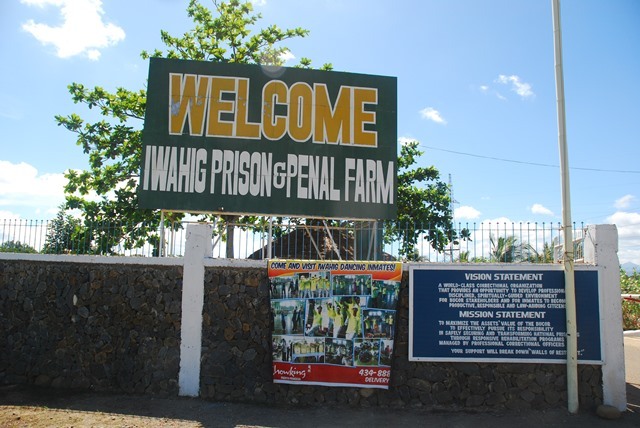 With decent food supply, freedom to roam vast plains and the opportunity to meet tourists from different countries, Iwahig seems like paradise to prisoners, but because the Philippines is a country of many islands separated by seas, transportation and communication is a problem. Given the fact that most prisoners come from financially deprived families and squalor conditions, every prisoner knows that once he is sentenced, there is no turning back. They leave behind everything that meant something to them. Their world is a prison, whether free or not.